It was my first day of work when I stumbled upon this tree(picture on the left) in Kwandong hockey center. This game venue was my favorite game venue because I got to work most of the games that happened in this venue and this venue was known for only woman’s ice hockey and few men’s ice hockey matches. Although this venue involved lot of walking for the data capture, I really liked working in this hockey center. 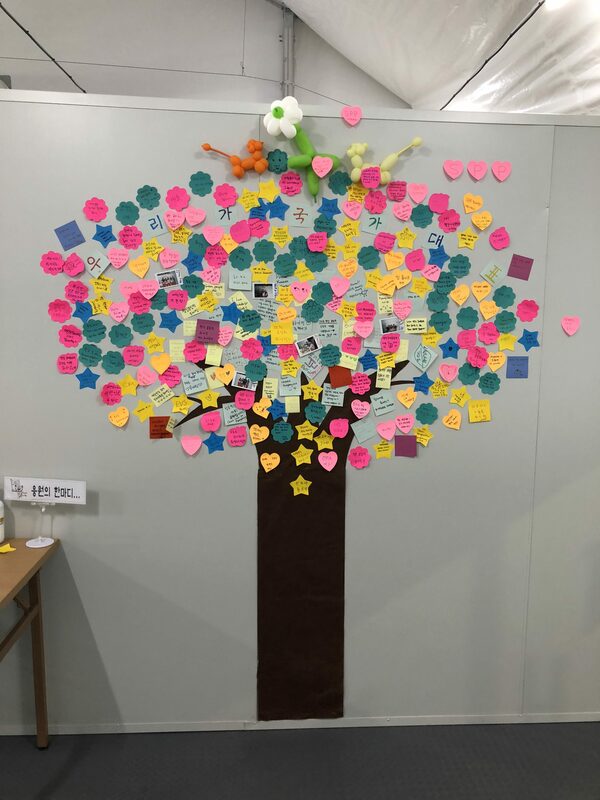 The tree on the pictures was made by volunteers of this hockey center to express their memories. The second picture was captured on the last day of my work at this hockey center which was the last day of matches in this hockey center as well. To be honest, almost all the post-it in the tree was written in the Korean language and only very few were written in English or any other language. 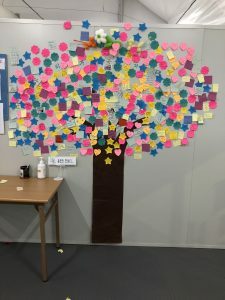 I wanted to write mine in Korean as well and so I got help from a Korean volunteer there to write “I love Kwandong hockey center” and posted on the wall as my contribution. I was lucky that I was able to work at this hockey center because of all the memories I gathered ranging from watching the winning moment of Finland against OAR(Olympic Athletes of Russia) for the bronze medal of Pyeongchang 2018, president of IOC(International Olympic Committee) Thomas Bach, South Korean President Moon Jae-in and Kim Jong Un’s sister Kim Yo-jong watching the Korea vs Swiss ice hockey match.